Manchester City's faltering title challenge lies in tatters as Mikel Arteta's late goal left them eight points adrift of Premier League leaders Manchester United. Arteta's 25-yard shot three minutes from time gave Arsenal a deserved victory and struck a devastating blow to City's hopes of preventing United claiming a 20th crown with only six games left. And to complete the abject misery for City and manager Roberto Mancini, the volatile Mario Balotelli - fortunate to escape dismissal in the first half for a dreadful challenge on Alex Song - was then sent off for picking up a second yellow card for another needless foul on Bacary Saga. The sight of Mancini gesturing furiously at the ill-disciplined Italian as he appeared in no hurry to leave the action was symbolic of a miserable day when City's hopes of winning the title for the first time since 1967-68 surely disappeared. Arsenal move back into third place with a win that threatened to elude them after Robin van Persie struck the woodwork twice and Theo Walcott saw a shot touched on to the post by City goalkeeper Joe Hart. The focus, however, will centre on City's demise and the circumstances involving another demonstration of Balotelli's flawed temperament that will see him suspended for three games with the possibility of further punishment for his challenge on Song, which referee Martin Atkinson did not punish as his view appeared to be obscured. The body language of City's players at the final whistle hinted at a sense of resignation to their fate - while members of the club's hierarchy watched on from the directors' box. City knew the extent of their task before kick-off after - and their job was made harder by the early departure of Yaya Toure, who never recovered from a heavy challenge from Song and was replaced by David Pizarro. And they had a fortunate escape after 17 minutes when Van Persie's goalbound header from Arteta's corner struck Thomas Vermaelen and rebounded on to the bar. As ever, Balotelli was the centre of attention and angered Arsenal with a studs-up challenge on Song that would surely have brought a red card from referee Atkinson had he been able to get a clear view of the incident. Balotelli then survived another brush with Sagna before eventually receiving a yellow card as the interval approached for another reckless challenge on the Arsenal defender. He ended the first half lying prostrate and alone on the turf after taking a knock in the back, but was eventually helped off accompanied by members of City's medical staff and was fit to resume after the break. City opened with a greater sense of purpose after the restart but it was the woodwork that once again came to their rescue after 62 minutes, Van Persie heading against the post after a moment of clever creation from Song. And City rode their luck again with 14 minutes left when Hart touched Walcott's shot on to the post, with Vermaelen and Yossi Benayoun somehow unable to complete the job from virtually on the goalline. 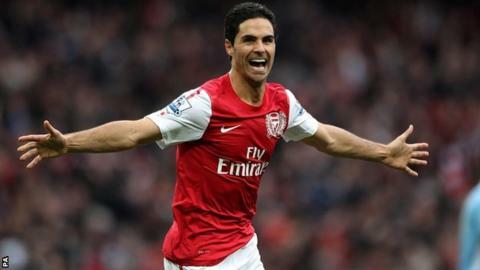 The breakthrough came with three minutes left as Arteta won a battle for possession with Pizarro before beating Hart low and powerfully to his left from 25 yards, leaving Mancini berating his side for the space and time the Spaniard was allowed. And with grim inevitability, the final significant act of the day was left to Balotelli, who senselessly lunged at Sagna to receive his second card. Even his slow trudge to the tunnel did not pass without incident as he was berated by Mancini for the speed - or lack of it - of his departure. The credits now appear to be rolling on City's attempts to win the battle for Premier League supremacy in Manchester. Arsenal manager Arsene Wenger: "We have been consistent in the last two months and the performance reflects what we have produced in the last 10 games: quality, spirit and determination. "In the end we got the better of them. The goal came late but we deserved to win. Against a good team like City if you don't score early it is always a test, we gave them very little. "Every time we are in trouble someone finds something special and the confidence is very high. The job isn't done yet. "City have a chance still but it will be difficult. If you are eight points behind with six games to go they have to win every game. The closer you get the less likely it is that United will make mistakes. "[Balotelli] It looked a red card to me, it was a bad tackle."